Michele and I spent most of the day working in the lab at ICI today, and doing a bit of research. I pulled a few books about longitude, mapping and a great science text called The Study of The Physical World that had some explanations of the different map projections of the world. 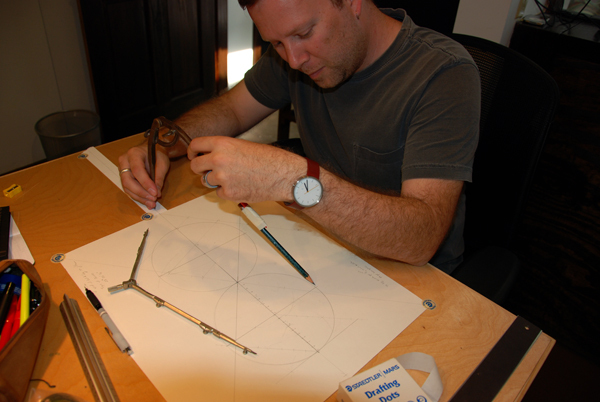 I decided to try drawing one of these, using only a compass, divider and straightedge (no measuring). 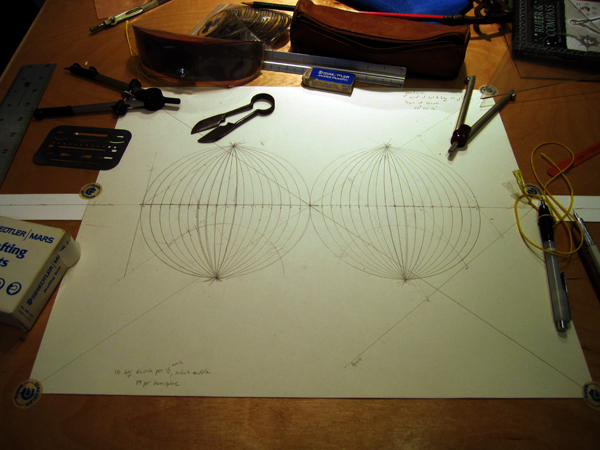 Actually, I wanted to draw only the graticule – the grid of latitude and longitude. Naturally, I started with the easiest to construct by hand – The Globular Projection. It’s basically two hemisphere views (as seen in old Atlases and earth science texts) laid out in circles tangent to each other. 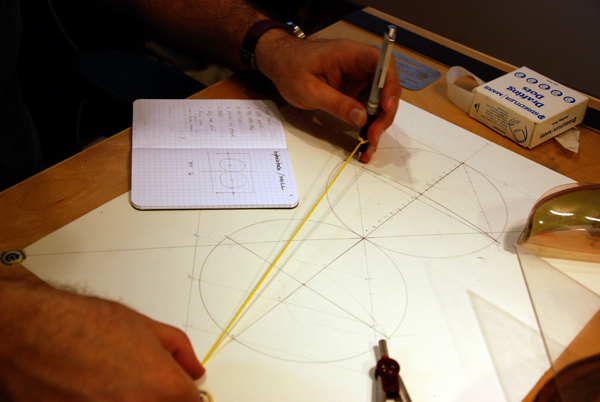 All was going great, until I had to figure out how to find the centers of the lines of longitude. Took me a bit to learn how to construct an arc that will pass through three given points, but once I had that down, it was on with the repetition. I still have the latitude lines to lay out tomorrow. I am hoping my precision gets better as this goes on – my lines were pretty fuzzy, and I had to improvise a couple of long compasses for the center points that went way off the page. String worked best. Around late afternoon I noticed the light coming in through the trees was pretty amazing, so I went around the place shooting short videos wherever the shadows landed. Will work them into something else down the road I am sure. Michele spent the day editing video that was shot over ten years ago on two different cross country trips (flying W->E in July 1999 and driving E->W in June 2000). 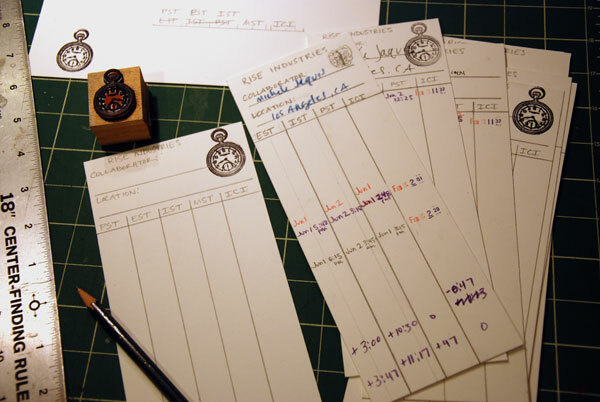 She also remade the timecards to include a column for John Kim’s Metric Standard Time. We’ll have to wait for John to arrive to figure out the conversion.